Newest cinema chairs 4d with ELCTROMAGNETIC LEVITATION system through thrilling, exciting 3D movie, lifelike blowing, water ,sweep legs , smoke, photoelectric, bubble and other special effects perfect combine with the story,.All of this bring the audience to a world that is both real and unreal. Audiences can experience from vision, hearing, touch with fresh stimulus. 4D/5D rollar coaster cinema feel as if you are there. This technology is a perfect combination of 3D images and effects produced by the special equipment upon the human perceptive organs. You become totally involved in what is happening on the screen. 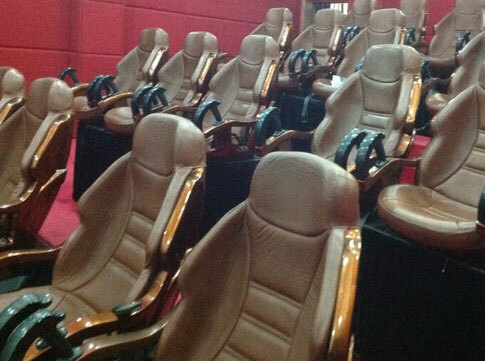 Our 4D/5D cinema based on 3D stereo cinema and unique technology with chair.The chairs can move flexibly.It has added various kinds of enviro mental effects including wind simulation,rain simulation,lightning simulation, snow simulation, smog simulation, bubble simulation, turn,lift,backward,forward,falling,vibration,drifting,subbuction etc.